The statue is located right outside GCU Arena. 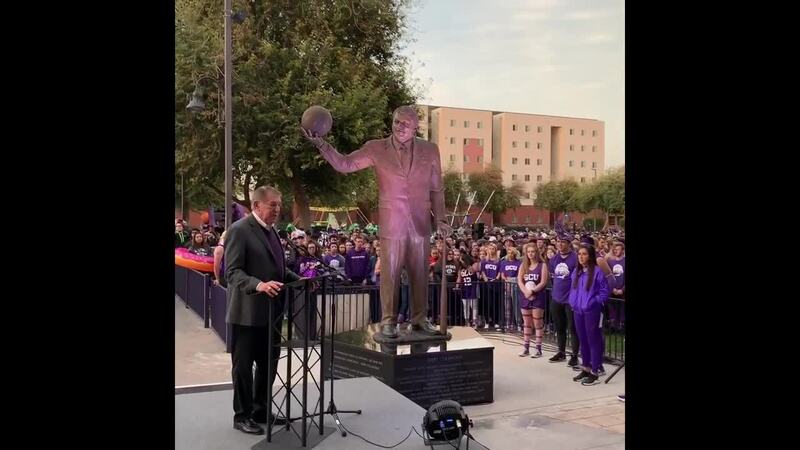 PHOENIX — Grand Canyon University unveiled a new bronze statue in honor of former Phoenix Suns and Arizona Diamondbacks owner Jerry Colangelo before GCU's men's basketball game vs. New Mexico State on Saturday night. Colangelo has served as an advisor to GCU, and the university's business school is named after him. He was on hand to witness the unveiling and address students and fans. Colangelo said he hopes the statue will encourage students to work hard to achieve their dreams. “You have to dream big, you have to work hard, and God will lead you down that path," he said.